I had a great commission earlier in the year for a scabbard for the Albion Kingmaker, based on the scabbard on an effigy of Robert Fitzherbert and dated around 1480 (can't remember the exact date). The was of course a rather time consuming make. I started with a scabbard core in poplar and the covered it in the leather. Over this I sculpted the form in jewellers wax. Originally this would have been done in a mixture of wax and rosin, so basically the medieval equivalent. It was then cast in bronze. With a large amount of sarcasm, both the foundry and I agreed it was a very easy casting to pour. The castings came back, just in time for me to mount them and carve the leather before whisking the completed scabbard off to Sterkshoff to hand over to a very happy Dane. Thanks to all the 'Yellow Bastards' for your hospitality, whisky, beer and singing. 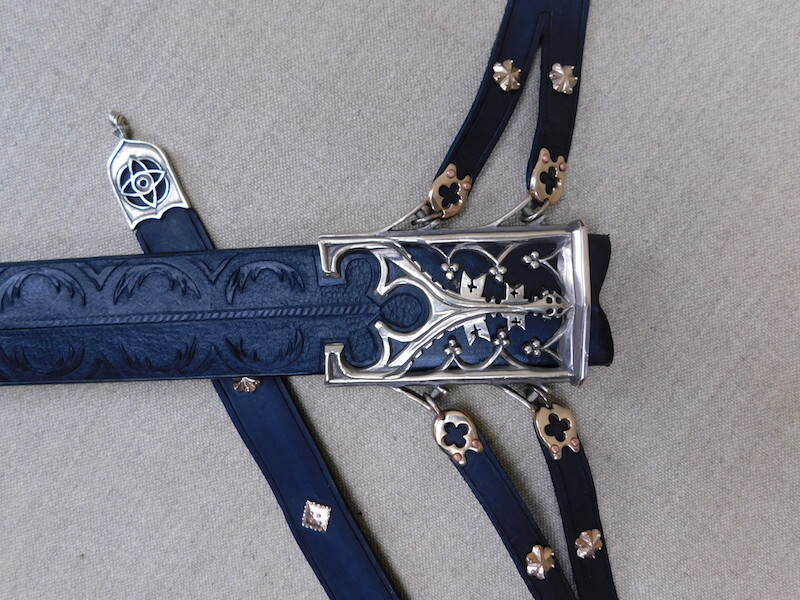 Amazingly beautiful scabbard and fittings ....... WOW ! So I imagine that carving the wax for the casting must have been a rather delicate job not having anything breaking off considering how delicate it must have been in wax. Making the master mold for the casting must have been " interesting "
Well, if there wasn't a need for a master mold to be able to make multiple castings, if it was to produce only one unique piece, I guess the casting clay would be applied directly to the wax model ? In other words one less step than for making a casting from a wood model that is used to create a master mold to make multiple waxes for a lost wax casting process !? ( I'm sort of thinking here of the process you used to make my bronze eagle's heads for me to use in making walking stick ). Another question: With the very very thin cross sections in parts of the design, did you have to do some clean up with files to remove thin webs of bronze between the thinner sections, or was the casting very very near all of the finished dimensions ? Doing the casting must have been scary because if it was for just one piece destroying the original wax model in the process, there was only one chance to get it right the very first time ! I can see where saying that it was " EASY " is really understated sarcasm. Seriously, though, that’s incredible. The leather work is unbelievable. Well done! "A despondent heart will always be defeated regardless of skill." 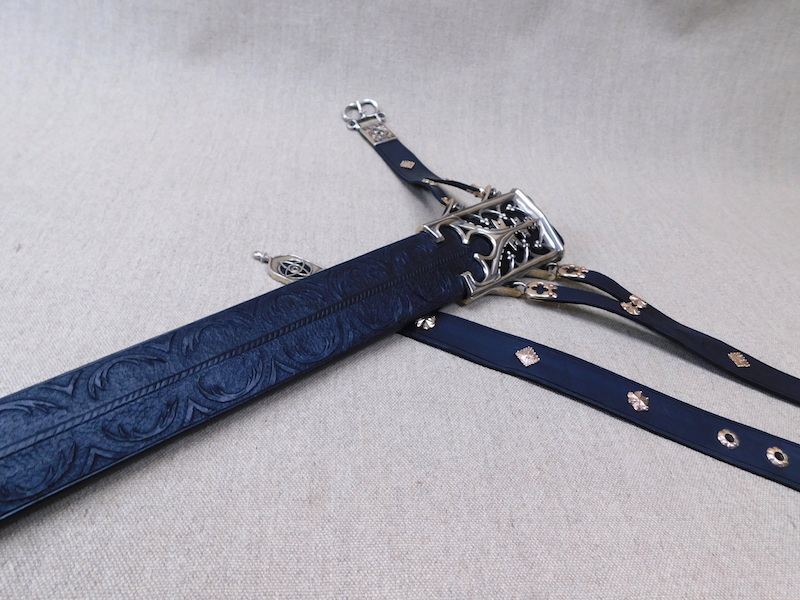 This piece is definitely among the finest scabbards I have ever seen done. The bronze and blue are a lovely match. I also like the relatively understated pattern-work on the leather. Beautiful. 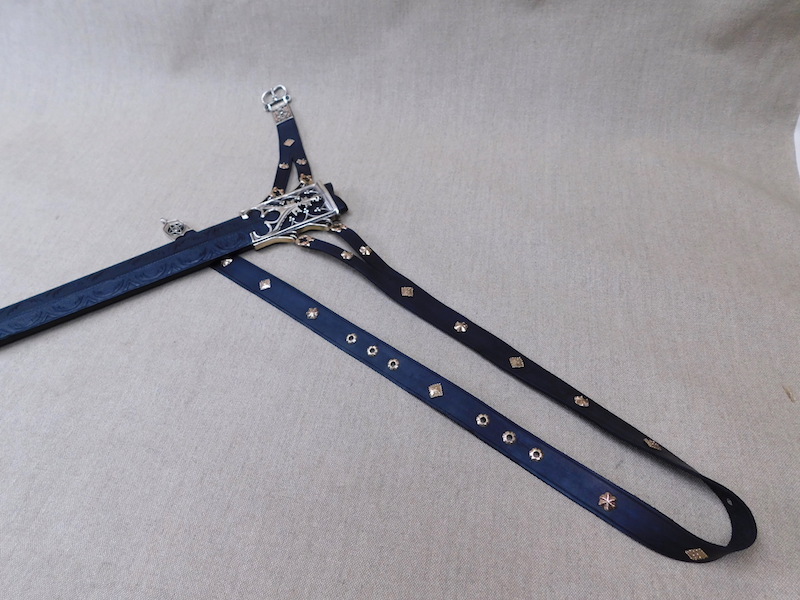 I think this might be my favorite of all the medieval scabbards I've seen, in the sense that both the castings and leatherwork are elegant but not overstated. Thanks do much for the praise and fine praise indeed - it really means a lot. Jean, sorry if I misrepresented, but this was a master that I made moulds for so I can get multiples out. With a complex casting like this, it would have been brave indeed to try for a single casting. 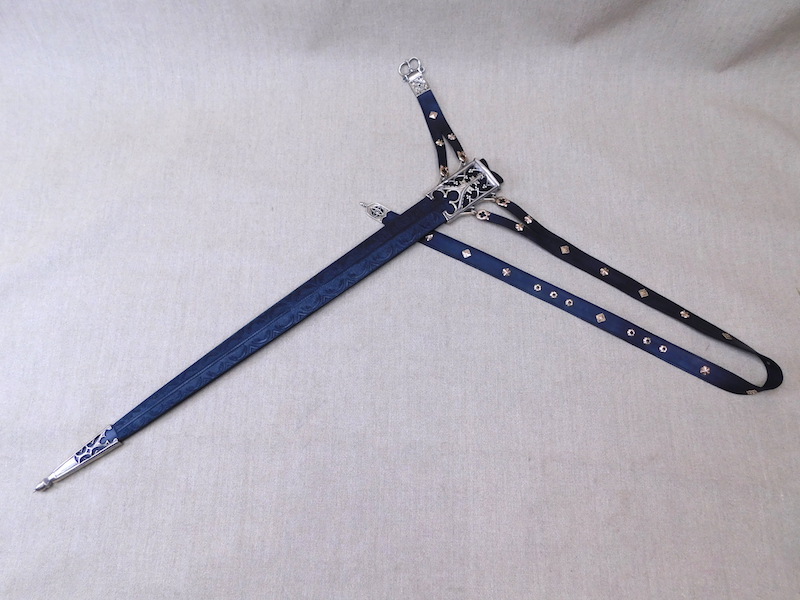 As it happens I have also used this casting for a film prop scabbard and also they are now available on my site. I will expand on the film in due course. Fabulous. Thanks for sharing this Tod. Absolutely beautiful work. I have been looking at English effigies and brasses so much as part of my research into English armour that I've also really become enamored of the swords and their fittings. What a beautiful reconstruction! Honestly, I hope this Kingmaker's getting a gilt or silvered hilt because the steel will look pretty plain next to all that! Good grief!! Absolutely amazing work, congratulations. 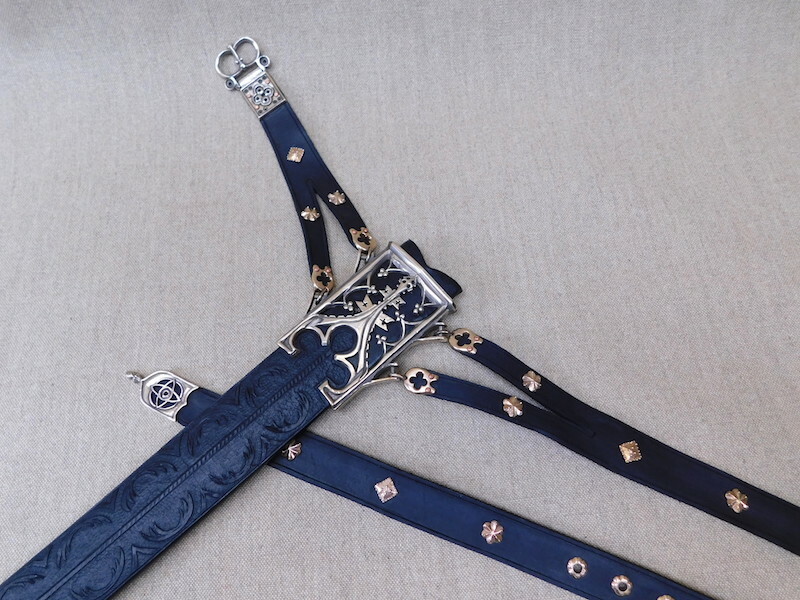 The detailing is truly spectacular, I love the was the leatherwork and metal work blend. I’ve never seen anything quite like this. Jealousy levels at 110%. Simply splendid. On top of your game as usual. A poorly maintained weapon is likely to belong to an unsafe and careless fighter. Thanks all, those are very kind words and very welcome. I would probably kill to have you, your work is none too shoddy. I hadn't seen this one until now. It looks amazing. I would have loved to see it with the sword placed inside. Are any such photos available? Thanks. Strangely I didn't take any, but if you look here, https://www.instagram.com/p/BjiF6lGAX3w/?taken-by=todsworkshop there is a picture of the new owner wearing it. This is art, that mouth is out of this world. Will you ever offer the hardware as a set? Wow, I really love it. Wow. Nicest thing I have heard in a long time. Thank you, but I'm really not worthy. It has been a while since my last visit to the forum. 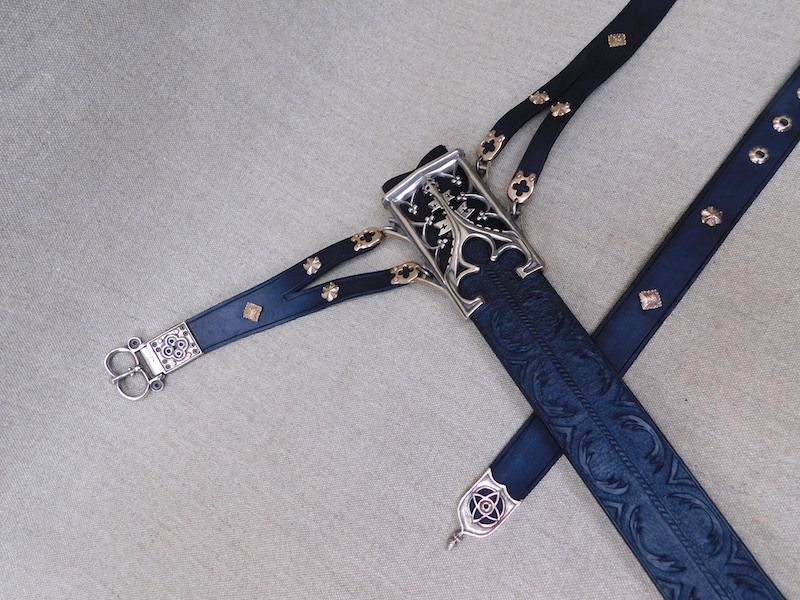 But none the less, attached is a photo of the fantastic scabbard with the Kingmaker (and myself in armour). The near vertical suspension works very well, not conflicting with leg movement. 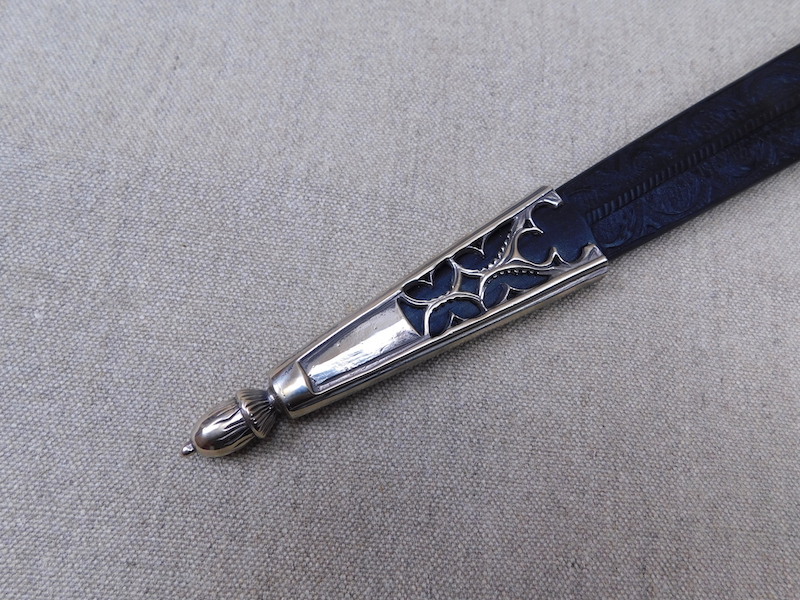 The draw from the scabbard however is very tight, but I think it is because the blade is butter knife sharp!? I intend to have it sharpened fully at some point, which might make it a bit more loose. Thank you again Tod for your amazing craftsmanship. I enjoy it on a daily basis on display along with my armour in our dining room.